Since its launch only a short while ago In the Emperor’s Name has created an enormous amount of interest amongst people who love the Warhammer 40K universe, but are not so enamoured of the rules that accompany it. We have had over 3,000 downloads from the blog alone. The quality of feedback, from AAR’s to individual comments on the blog, the Yahoo Group and on other blogs and fora has been excellent. As a result we have been able to create a lot more material for this game as well as improve and clarify the rules. – The separation of the Core Rules, Retinues lists and Campaigns rules into three separate booklets. This will make it easier to update in the future as well as saving gamers’ ink on printing things they do not need. – Complete weapons and armour listings, drawn from all the Retinues. – A section on light vehicles from the humble ground car all the way up to the Chimera and Rhino. – Special abilities, old and new, have been gathered together in a single section. – There have been small changes to the rules of play both to make them clearer and to include simple changes to improve their playability. – Grit is now costed on a sliding scale, due to its in-game importance. – Weapons costs have been increased in many cases to take account of their range and the effect of some deadlier weapons on the Grit Roll. – A swathe of new and improved Retinues have made it into the listings. – All Retinues have been recosted to take into account the changes in Grit and Weapons’ costs. The base cost for a Retinue is now 200 pts. – The Campaign rules have been updated to reflect the changes in Core Rules and Retinues, as well as being generally improved. – Unique cover art from Joseph Urban. Not all the good ideas that have come forward have been included in this edition. Some will be released individually on the blog, others in new supplements once we have enough material. There is still a lot of the Warhammer 40K universe to explore, from Enslavers, Dark Eldar and Hive Fleet infiltration units, to new campaigns and dangerous locations. Anyone fancy hunting a Lictor on an Ice Planet or in the depths of the Catachan Jungle? More Psychic Powers and Special Abilities anyone? And who just loves the Assassins and their Temples? We hope that you enjoy these rules. The Forge of War Development Group. I am not sure what you meant by your comment. Could you explain it to this daft old begger? It’s also wise to check their sites regularly regarding alterations in coverage. Craig – I figured out the problem… I was trying to set up an account I already had. I have not seen your application pop up yet…? Go for it mate and keep us up to date with your efforts. Even better come and join the Forge of War Development Group Forums. Thought you guys might like to know – I’m wokring on converting ItEN into a more generic fantasy skirmish game (the rules are so magnificently simple, it would be a shame not to! ), providing full credit to yourselves and continually linking back to this wonderful site! a question to the players here. rule “run” as is exactly. pq from one page to another change! Hello there! This article couldn’t be written much better! Looking through this post reminds me of my previous roommate! He constantly kept talking about this. I most certainly will send this information to him. Fairly certain he will have a great read. I appreciate you for sharing! I agree to your terms. Please contact me through Facebook in a private message with your e-mail address so that I could send you the translated rules once ready. 2. Send us PDF copies so we can share them on the blog. May I have your permission to translate these rules into Hebrew for the benefit of the Israeli wargaming community? There is a Dreadnought described on page 12 of the core rules and has the following stats: Grit 3+, FV4, SV4, Move – none except turning, 12+ Armour, Heavy Bolter and Power Claw. One of the reasons it’s not included in any Retinues as we thought that it would be far too powerful. Based on the formula Figure cost = Grit + FV + SV + Speed + Armour + Weapons, we can see that this Dreadnought would cost 42 points. Is there any way that someone can come up with the rules and costs of running a dreadnought in your retinue? Cause in all actuality I can’t think of any other unit that I’d want to have. Thanks! Excellent feedback – thanks. Sorry for the delayed reply but I’ve been working crazy hours. On the Speed bonus: let them have it while stationary, but try this: You get -2 for shooting at someone who has made a full move, and -4 for trying to shoot while moving. If someone then runs in a circle and ends up in the same place that is called duck’n’weave, they are harder to hit but their shooting is going to be lousy. On the shooting two weapons you could introduce a new Talent for five points that allows someone to ‘get their guns off’. I’m glad you enjoyed playing ItEN. This is a ongoing cooperative effort by the Forge of War Development Group and absulutely encourage people to write and try their own versions. Thanks for ITEN, very enjoyable rules! With the games I ran I found I had to change a couple of things, mostly to get round my players exploiting “loopholes”. So I thought I’d see what you think about my solutions. With regard to adding a target’s Speed bonus to it’s armour only if it moved my players exploited this by moving all the time, sometimes only by a fraction of an inch. My solution was to rebrand the bonus as a dodge ability and let players have the bonus when shot at even if stationary. This did not break the game. An alternative suggestion was to put some kind of bonus in for shooting while stationary, in effect “aiming”. With regard to running in the shooting phase we play true line of sight (is that correct?). This meant that models were frequently in line of sight which in turn led players to the tactic of using normal movement to hide models just so they could then run in the shooting phase – especially when out of range. This got very daft very quickly. My solution was simply to allow running or shooting in the shooting phase but not both. This did not break the game. With regard to getting up after being knocked down we had quite a few instances of tortoise on its back syndrome. Whilst funny, spending multiple turns just trying to stand up became silly. My solution was to allow +1 to the roll to stand up per previous turn spent trying and +1 per friendly model trying to help. This worked fine. A question arose concerning figures armed with two guns, one in each hand, and whether the model could fire both at the same time. My solution was to allow the figure to count as its own torrent I.E. adding +1 to its shoot for the second weapon. I would suggest adding abidextrous as a special ability to cover this. With regard to the running distance you have made it clear in the comments here that the random distance should be used. On page 3 “A note on figure scales” you give absolute distances for other scales. When adding pts after a number to indicate a points value there should not be a space between the number and the pts. This needs checking as sometimes there is and sometimes there isn’t. One final note, everyone that took part in the games really enjoyed the speed at which it played compared to other skirmish systems and all appreciated the simplicity of the mechanics. Everyone said they would look forward to playing again! I can understand why some people would love Inquisitor. It trod a fine line between skirmish wargame and RPG. However, the speed in which it got ‘remaindered’ into the Specialist games ghetto says a lot in my mind. It did not sell because people found the core system was confusing and flawed. No matter how glossy the book, or how well written the fluff is a system must survive on its rules. I’ve just started reading through the rules. 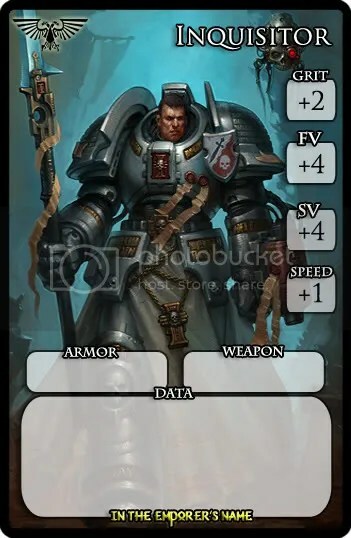 Looks good, but I have to say I disagree with you on the subject of Inquisitor: I’d be more inclined to say it’s the best ruleset GW has ever created. Yes, the rules look incredibly cumbersome, but I’ve found that they become far more intuitive than, say, regular 40K after just one game. (perhaps not as intuitive as the one-page rulesets found here, but then again, it offers a lot of material to work with) There is, I have to amdit, one catch though: it only works well when used as a narrative skirmish game. Upscale the battles or neglect the backstory and narrative, and yes, it suddenly seems one of the worst systems. I was thinking if fielding a Pre-heresy Space Marine warband. How cost and stats for a space marine jetbike would look like? Also, the extra inquisitorial agents section. Each agent has a base cost, and then the statline as well. I’d assumed that the base cost was for the defualt statline, without any upgrades, but then I noticed that the grizzled veteran had 11 points worth of stats, and had a base cost of 10. Is the base cost in addition to the stats? You can indeed field one or two mercenary Kroot. If we look at the W40K fluff, Kroot have their own spacefaring capability so are not as savage as many people seem to think. Yet despite this and the influence of the Tau they haven’t developed or chosen to use any heavy armours. I expect that most armours would impede their ability to do all the woodcraft stuff they are famous for, or would not feel right with their hunter mentality. However, I expect that you could successfully argue that they might choose to wear a Kroot version of Flak Armour if you wish. I have a question. Looking through, I realised with delight that, due to the “Strange Ally” rules, I could field a Kroot with my inquisitorial retinue (radical ordos xenos FTW!). However, the rule makes no mention of what the model comes equipped with, and what it can be upgraded with. Sticking with the Kroot, can I give him some improved armour, or is he stuck with the basic Kroot armour? So, originally the Traitor Legions Retinue list was written to just have ‘vanilla’ CSM’s in it. Then someone suggested allowing you to field Legion-specific CSM’s, so I wrote a little table and have been confusing people ever since. You can indeed have a vanilla AC with a few mixed Legion marines in his Retinue, which does make a little nonsense of the Black Legion’s special ability… something for me to chew on that. Thank you very much for answers, Craig. I’m still a bit confused on Black Legion Champion. If I purchase a Champion without making him from a particular Legion, then I can anyway field mixed-legions Retinue, isn’t it? Or, I HAVE to give each Chaos Space Marine a Legion (for 5pts), I thought this was optional. 1) Black Legion: In a Chaos Space Marine Retinue you can mix figures from different legions. However, if the Aspiring Champion is of a specific Legion then all other Marines must be from that Legion also. So a retinue led by a Black legion Aspiring Champion can mix and match, whereas other AC’s cannot. 2) Word Bearers: This is a hangover from when there was a specific summoning power (very early edition), well spotted. Ignore it. 3) World Eaters cannot have Sorcerers. This is for any retinue that is led by or made up of just World Eaters. Hi, great work, thank you! 1) Black Legion: why bother paying 5pts to make my Champion BL to have any other legion marine in his retinue while I can have the same effect for free not giving him any Legion? 2) Word Bearers: Champion or Sorcerer begin game with Lesser Daemons. What does it means? They get one for free? (seems too much for 5pts), or that without a Word Bearer Champion/Sorcerer you cannot add them to retinue? If so, should stated in Lesser Daemon description. 3) World Eaters cannot have Sorcerers. This limit is for a full World Eaters retinue, or Sorcerers are forbidden if just a Word Eaters is in the retinue? O the ganging up – I suppose that it does, but we do go on to show how adding more men would rapidly make it worth it. We’ll shortly be moving from our Yahoo Group to a Bulletin Board and we’d be happy to have you come in and join the crew, especially with your eagle-eyes. Once we move I’ll put your corrections to the team. it looks like we’re going to need an errata sheet soon, or a new relase. At the beginning of each turn each Player rolls 1D6 and adds his Leader’s Speed, rerolling any ties. The Players then act in order from highest to lowest in each phase. This lasts until the next turn. This ruleset looks like great fun – i’m excited to try it out. pg5: Inquisitor example should be 62pts, deathcult assassin 18.
pg5/6: The Retinue members with Terrifying notes dont say [5pts]. Most retinue entries (tho not all) do. Pg8-9: Harlequin’s Kiss & Warscythe have an asterisk , with comment of “For more on the grit penalty see 7.5 The Grit Roll”. There’s nothing specific to Harlequin’s Kiss/Warscythe in 7.5. Special rules for these are in the retinue section. Other weapons w/o a * have special effects however (graviton gun for example). Warscythe is also a ranged weapon when used by a pariah according to the Necron retinue — does it have a different cost, and what’s the range? pg 12 6.3.6 – Dreadnought cannot move “except turning”. Does the facing of a model have any effect? There’s no mention anywhere if models have 90, 180 or 360 vision (or other) that I see. pg18 – Does Invoke faith make the priest/bishop/chaplain immune to terror? pg21 Point costs for all vehicles are too low by 1 pt, like the first crew member wasn’t counted. Misc: The armour None/Light/Medium/Heavy classfication don’t seem to have any bearing, other than being equal to 5+/6+/7+/8+. Same for Weapon type, but it’s worse for weapons – because AFAIK a “Heavy Bolter” requires a 2nd crewman, but a Plasma gun doesn’t despite being “Very Heavy”, nor a “Heavy” Bolt Pistol. Suggest dropping the Weapon and armour light/medium/heavy classifications. Pistols have a special ability, but there’s no note of which are considered pistols. Most are obvious, but IIRC a Neuro-Disruptor and Slugga are the non-obvious pistols. Same for “Heavy” weapons — heavy bolter, heavy stubber and heavy gauss blaster probably count as Heavy for crew purposes. But are Rokkit Launcha’s heavy, Shrieker cannon or any others heavy? Same goes for what the Xenos equivalent of power armor — anything with a to hit of 8+, excluding displacer field? is it an i go you go system? I can’t wait to give it a try with friends! So far I’m just reading the rules but I really really like it! The fact that you made every possible character of the 40k universe playable is just awesome! I really appreciate your work so far and even if I haven’t done any “real” game with those rules, it seems like a hell lot of fun! Compared to our one-page Small Unit Action Rules (FUBAR) I suppose that they are. However, the actual rules for playing the games cover just four pages (13-16), and 25% of that is examples. Certainly a lot less that the 70+ pages of Warhammer 40K (in a 300+ page book). The key thing about ItEN is the playability. Most players pick up the rules in just one game. Wow those are complicated rules. Good eyes errorreporter, another one for the edit list – thanks. It seems I may have miscalculated some of the examples in the retinues as well. I’m working on a corrected copy over the next few days. The cause is that we changed the costing system a few times in the last few days before publication which meant an old idiot going through recalculating things about four times. points costs from vehicles on page 21 has a description error. points for Armour is missing and points for crew is wrong. Let’s see: During the shooting phase, if a model has no enemies in line of sight, that model may choose to run an additional 3″ instead of shooting. Yes, except that it should say 1D6+Speed”. Is the wording of the running rules intended to forbid running when there are enemies in line of sight? Because that’s what they say. Please remember to list the people who asissted you with the translation on the credits page as Translators. We are always happy to have our friends around the world translate our rules into their own languages. All we ask is that you send us a copy so we can share it here with everyone. I’m considering translating it to brazilian portuguese, but I’m not sure if I want to have all this trouble myself. I’m recruiting help in the local community. Any plans to add squats? Action-packed fluff heresy gaming based on Space Marine book, anyone? Very nice! I started playing Rogue Trader in ’89 and haven’t liked the direction GW has been going with 40K since. This may rekindle my interest. You are probably right, but all this is being addressed in the 2nd Edition, which is currently being worked on by the team. It’s just that the examples for Chaos Space Marines seems to be incorrect (Theres no points added for Word Bearers) and in the Retinue Generator for Chaos Space Marines aswell. Thank you so much for this translation. I see that you have joined the Forge of War Yahoo Group as well – excellent! We do have other language translations of FUBAR, but this is the first translation of In the Emperor’s Name, so it is very welcome. I hope that many French-speaking players can now enjoy this game. “In the Name of the Emperor” just cross the channel to become “Au Nom de l’Empereur”. I just translate the core rule without any Annexes. A first glance makes me say ‘well done’. So what I’m going to do is drop this into the Forge of War Yahoo Group for comments by the team. You are welcome to join the group and you’ll find it a positive and friendly rules-writing community. My only thought so far is to drop the ‘Terrifying’ classification from all but the Lord and Flayed Ones. OK, here’s my attempt to write a retinue for Necrons. This has obviously not been tested or balanced at all, and is just a first draft. If you do a Necron Retinue please share it with us on the Forge of War Yahoo Group. We can then include it in the next edition of the rules and you will be be credited with authorship of them. I just skimmed through these rules and they look great! I must try to persuade some of my friends to try them out. Many veteran gamers will have loads of old miniatures that they can’t really use any more, because they’ve been retconned out of existence over the years. This game can give them life once again, as we have a lot more freedom to max and match. If I had one complaint, it’d be a lack of a retinue generator for Necrons. But I would enjoy writing one for myself.